When the “no parking” signboards started going up on our block a week or two ago, we knew something was up. Sure enough, a couple days ago the heavy equipment, noise and dust arrived. The next day the letter from Seattle Public Utilities finally came: A sewer line repair would be taking place during the next four weeks. I waited until today, Saturday, when I knew they wouldn’t be working so I could get up close and personal with the bright yellow digger. 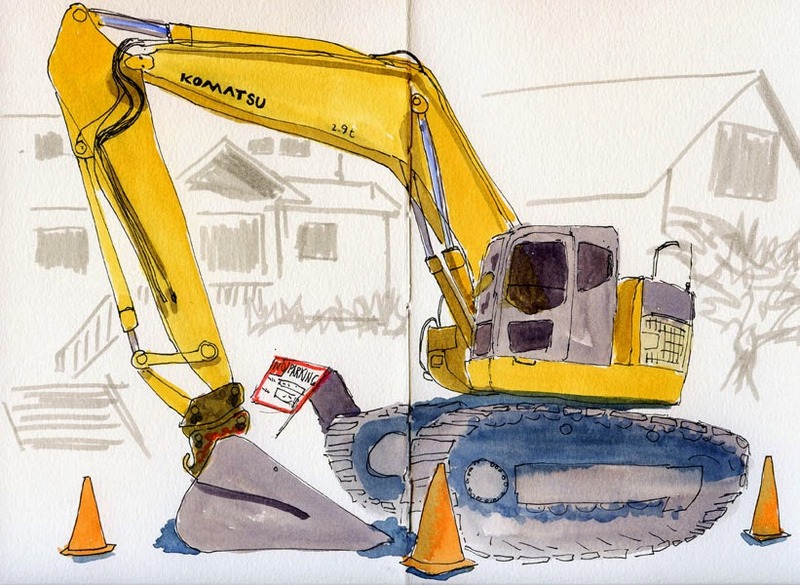 Cars, planes, boats, construction machinery – sketching vehicles of any kind intimidates me. But I have been looking at and thinking about all the delightful vintage cars in Lapin’s book and how he makes them come alive. I have also been thinking about Inma Serrano’s Urban Sketching workshop in Barcelona last year, during which she urged us to sketch buildings as living, breathing monsters instead of inanimate architecture. It doesn’t take much imagination to view a crawler excavator as a monster, so I pulled up my little stool a few feet away from the big guy and channeled my inner Lapin and inner Inma. Your inner Tina is the best!